OnePlus 6 is expected to come out in next couple of months and recently we have been seeing a lot of leaks around the OnePlus’ upcoming flagship. Now, a recent leak has revealed the hardware specs of the OnePlus 6 and most importantly it’s pricing. The latest leak doesn’t contain any press renders of the OnePlus 6 smartphone. However, we have already seen several leaks around it and even live images of OnePlus 6 have been surfaced during the last couple of months. Now, some of the specs of the OnePlus 6 are confirmed by this leak along with the expected price. The leak is important as it reveals that how much will the OnePlus 6 cost along with what specs it will feature. As we can see from the leaked picture, OnePlus 6 will be priced at $749 which means Rs. 48,500 approx. So, if it turns out to be true, OnePlus 6 could be the most expensive from the Chinese smartphone maker till now. However, still, it will be quite affordable in comparison with Apple and Samsung flagships. 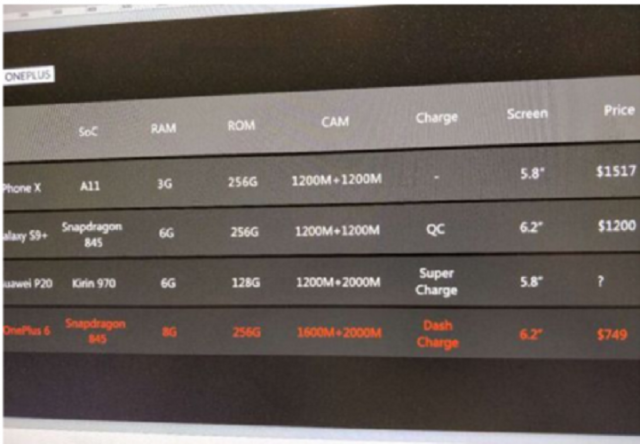 If we talk about specs of OnePlus 6, these have been leaked in benchmark listing of OnePlus 6. Now, the latest leak confirms a few of them. The first thing we all know until now that it will be powered by Snapdragon 845 processor. To make things even better, the processor is clubbed with an Adreno 630 GPU that means OnePlus 6 will be able to run all sorts of mobile games. Further, one of the smartphone’s model will feature 8GB RAM. Coming to the other specs, the live photo leak showed the phone running Android 8.1 with OxygenOS 5.1 on top. Also, obviously the OnePlus 6 will feature the dual rear camera setup. Another important feature that’s being highlighted by some recent leaks is OnePlus 6’s display. 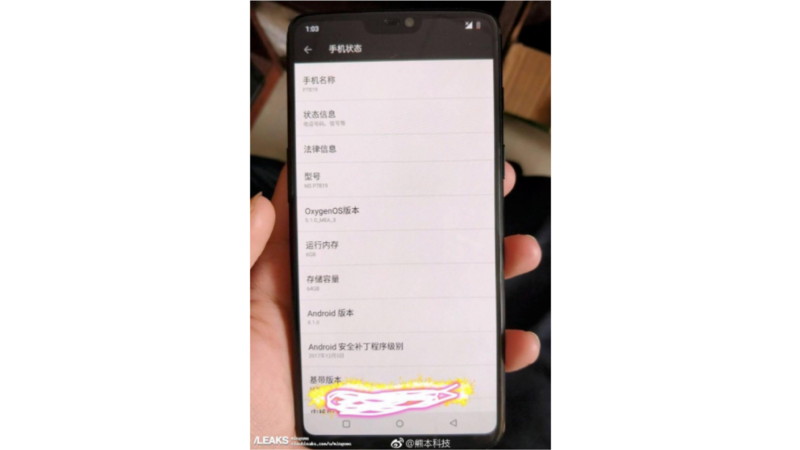 Several leaks and live images of OnePlus 6 have suggested that it will feature the trending notch display, and if the Oppo R15 design is anything to go by, then the notch display is almost confirmed. According to the rumor mill, OnePlus 6 will have a 6.2-inch Optic AMOLED technology with a high pixel resolution of 1080 x 2280.